It’s possible that it’s a little backwards, but to me Halloween should be as enchanting as it is creepy. It should be as intriguing as it is eery. It’s just how I see it. (Kind of like this not-so-eery-but-whimsical confection from my last post.) So I decided to create another treat this week that’s been on my mind: Black Velvet Cupcakes topped with Cherry Cream Cheese Frosting. There’s a good chance that these would have been a cake (and still may be), but every time I think I’m over cupcakes, I go and find cupcake-related doodads that steal my heart. I found these amazing Robert Gordon Australia cupcake liners last week while shopping at our Canadian shop, Winners (kind of similar to the American Marshall’s), and I was eager to try them out. Because they’re rigid, I wasn’t sure how they would work in terms of actually eating the cupcake, but with a little pull of the seam, it’s easily removed. Since they reminded me of a pink circus, I thought they’d be fun to use for these creepy-but-sweet carnival cupcakes, but really, any fun cupcake liner would do. If you’ve not made Black Velvet cake before, you’ve probably figured out that it’s just like the southern delight, Red Velvet cake, but very black, rather than red. But if you’ve not had “velvet” cake of any kind before, don’t be fooled–this just isn’t chocolate cake tinted with copious amounts of food colour. With your eyes closed, it’s really a slightly chocolate, buttermilk cake that’s super tender, moist, and rich. With your eyes open, the deep, dark colour (whether it’s red, black, or purple) somehow makes the whole experience that much more decadent and luxurious. I’m usually pretty disciplined, but I could not stop eating these. I’ve posted about a Red Velvet Cake in the past, but this time I started with a recipe I found from King Arthur Flour, and I played around with it. Paired with an almost-traditional Cream Cheese Frosting, these cupcakes are like tradition-with-a-twist. Rather than topping them with a completely classic cream cheese frosting, I decided to add a few tablespoons of Bonne Maman Cherry Preserves . You could certainly omit this step, but it’s kind of a magic pairing, if I do say so. That being said, I’m pretty sure that the classic cream cheese frosting would be magical in its own right. Or just do what I do and eat a few of the cupcakes warm from the oven, sans frosting, and then take your time later with one (or two) fully frosted version and a strong cup of good coffee. Who said Halloween was scary? Eesh, you’re right–creepy clowns are watching us. There they sit perched atop the otherwise innocent cupcake staring at us. Don’t be fooled by their smiles–they are pure evil. Evil I tell you. Evil. At least this is how I feel about them, and why they adorn my Halloween cupcakes. Despite their being creepy and evil, though, I can’t help but being strangely drawn to them. Which, again, is why they adorn my cupcakes. This image (from Flickr) is so hauntingly beautiful that I can honestly say it’s the only clown photo that I have ever seen that is almost creepiness-free. I want to hang this on my wall and be with it always. So there are exceptions. But, for the most part clowns = scary. That’s all there is to it. I found these toppers on one of my favourite shop websites, Hey Yo Yo, but I’m pretty sure any clown topper would add the eery-factor. Preheat the oven to 350°F (180°C). Line a muffin tin with 12 standard cupcake liners. In an electric mixer fitted with the whisk attachment (or paddle, if necessary), mix the sugar, butter, oil, black colour, vanilla, and salt on medium speed until very light and fluffy, about 5 minutes. Add the egg and mix on medium speed until just incorporated. In a medium bowl, sift together the cake flour and cocoa powder. Add 1/3 dry ingredients to the mixer and blend until just combined, then add 1/2 of the buttermilk. Alternate until all of the dry ingredients and buttermilk have been added. In a small bowl or measuring cup, combine the vinegar and baking soda. Add to the batter and mix until incorporated. Divide batter among the cupcake liners and bake until a toothpick comes out with a few crumbs only, about 22 minutes. Remove from oven and carefully (it's hot!) turn baked cupcakes onto wire rack right side up to cool. Using electric mixer fitted with the paddle attachment, blend butter and icing sugar on medium low speed, until just combined, about 2 minutes. Add cold cream cheese, all at once, and beat on medium speed for about 2 minutes. Add vanilla and salt, and beat at medium high speed for about 1 minute. Be sure to not overbeat, or the frosting will start to become too thin. Add cherry jam and and mix on low speed until just incoporated. Cupcake liners I used are from Robert Gordon Australia. Clown Cupcake Toppers from Hey Yo Yo. Cupcakes are best enjoyed day 1 or 2. Store leftovers in the refrigerator (because of cream cheese), but serve at room temperature. If you’d like your frosting to be a little more pink, add a drop or two of pink food gel. Oh, the clowns are creepy! I always think of IT by Stephen King when clowns are mentioned.. Clowns and spiders, ugh! Thanks, Stephanie! I agree–that clown in IT is possibly the scariest clown of all time. Eek! Absolutely fantastic, Rosie! I must admit that I don’t really like clowns(scare me! ), but these are “Halloween-cute”. I will be trying these cupcakes for my Halloween treats for sure. And the Cherry Cream Cheese Frosting…yummy! A wonderful match! These are the cutest Halloween treats I’ve ever seen!!! I just love these! The photos really give it a vintage circus feel, and the cupcakes sound incredible. Thanks for sharing! A few weeks ago I added Bonne Maman Cherry Preserves to some leftover vanilla whipped buttercream and used it to top a mini 6-inch, 2-layer chocolate cake that I had filled with the same preserves. It was so delicious! These look great, and I can’t wait to try them!! They are so cute (as always!). I’ve used Robert Gordon Australia liners but the colour of the liners always seem to get oily from the batter. How do you keep them so clear?! Thanks so much, Zainab! You know, I found that a few of them were a bit oily, but for the most part they were clean. It seemed that the cupcakes that were baked a little longer were the ones that started to show some oil. Hope that helps? i have the same cupcake cups in a sweet red chevron pattern, which i purchased at Marshalls. lol. beautiful post, as usual. These look amazing! It’s the first time I’ve seen black velvet cake/cupcakes. Wonder if there’s a natural way to get the black color without using food coloring? PS I haven’t seen a photo fit the description “hauntingly beautiful” so well before. That is such a sad but wonderful photo. If you people are into scary clowns, read Will Elliot’s “The Pilo Family Circus” – it’s creepy but also hilarious! And the cuppies look wonderful… they make me think of girly vampires. I’ll have to throw a theme party just for that! These are stunning (as always). Lovely design! Clowns are rather creepy for sure but I do love the great work that the Shiner’s Clowns always do :) I’m with you on Halloween being on the enchanting side more than on the scary side. The cupcakes are so enchantingly dark and your pink frosting is beautiful on them. You can get that same black color without the food coloring by using black cocoa. I order mine from King Arthur. It has an oreo flavor. I sub it for part of my regular cocoa powder. It’s a little strong to sub all of it in. Experiment with it and see! These are great and the pictures are beautiful! I just saw these liners at Home Goods (like Home Sense in Canada), I’m thinking of going back to pick them up after seeing how darn cute these cupcakes are. I would never think of making Black Velvet cupcakes, but I love them. I come here to see all the cleverness that I don’t have. Ok, I can’t bake. There, I said it! But I love to come here and see what amazing things you come up with. You are incredibly talented and I bow down to your glory, lol! Anyway, I have never heard of black velvet but I would love to try these since they look amazing! Now I will return to lurker mode. I love the contrast of the pink against the black cupcake. I think it’s great you’re making Halloween a bit less scary (save for the clown toppers) – little kids can get really scared by it! Love the pretty pink against the black, great cupcake liners! Those clowns really are creepy…I love the idea of the black velvet cake and the way you describe it makes me want to run to the kitchen and start baking right away! Hi, Thanks for this recipe. I used it for a cake. I am also at high atiultde. I used a 9 round pan and only did 2 layers. The cake took almost an hour to bake and I only needed about half of the frosting and 2/3rds of the custard. It was my first time doing a cake and custard from scratch and I am very pleased at how it came out. I read this last night on the way to a formal function for my husband’s work. Then I knew I wanted to bake them. But, seeing how I would gain 500 lbs if I baked and ate everything that I wanted to from this blog, I had to think of a place to take them. Then I remembered we had a potluck to go to today! So when the kids woke up at 7:00 this morning, I set to work on these, and we were enjoying them by lunchtime! Wauw Rosie. They look absolutely amazing. I just have one question : who eats all your fantastic cakes, cupcakes and so on? My boyfriend tend to scolding at me (in a nice way) because im baking all the time. That’s his words. Lol. These cupcakes sound so delicious, Rosie! Although I am not sure about the toppers, clowns freak me out! Anyway, I have a few questions too. Do you know the best substitute I could use for buttermilk? I’ve been using whole milk plus cream of tartar with 1 cup : 1 tsp ratio. What do you think? Buttermilk isn’t really that accessible here in the Philippines so every time I see it on any recipe, I feel kinda troubled as it may give a different result if I substitute it with something else. And also, will it differ if I use a regular vinegar instead of the white one? Hi Camille! I typically use whole milk (or even 2%) with 1 teaspoon white vinegar (just plain vinegar) for every cup. I shake it well so it’s nice and bubbly, and always use at room temperature (or even a little warm) in cake batter. I hope that helps! These are awesome thank so much! I just made these today and they were DELICIOUS! However, my frosting was more of a mauve color than pink like pictured. Even if I had added pink coloring gel, I don’t think it would have been the same hue, because the base color was already dark in tone. Was it photo editing that made them look so cheery pink? I love these!! So beautifully made all deep and dark, then perfectly paired against cherry. The pics are gorgeous. 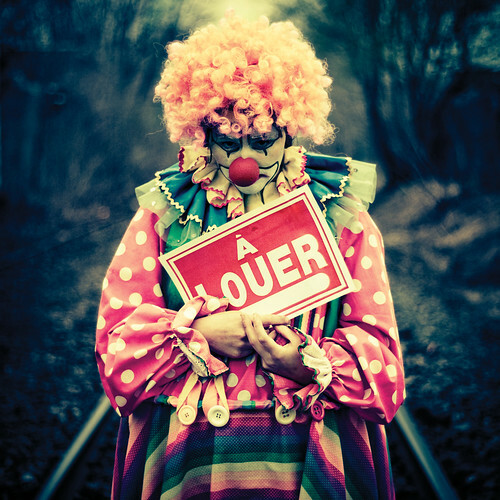 You are right about the clown picture-I also love the color tones of the picture as well. Hi. I love this recipe, but I have a question. Is 3 tbsp of cocoa powder really 45g? I tried this recipe once in volume. Then I did it again in weight and 45g of cocoa powder just seemed a little much. My batter turned out a lot darker too. Just wondering if I’m doing everything correctly when I’m measuring in weight. Thanks! Hi Tina! Thanks for the comment. I’ve just weighed the cocoa powder again, and what happened was I actually measured 3 heaping teaspoons of cocoa powder at 45 g when I made notes on this recipe. Sorry for the confusion! 3 proper tablespoons weigh 30 g, so I have adjusted the recipe to reflect that. I’ve made it a few different ways, and liked them all, but I think somewhere in the middle for the cocoa powder is ideal. Thanks for pointing this out! What a delicious cake.. a mouth watering dish with a perfect description, can’t wait to try it soon..
Just a wick question for you. Do you know what the English version of cake flour is? Hi I don’t know weather you got an answer, I live in England and make the red velvet cupcakes frequently, the best alternative for ‘cake flour’ that I have come across and been recommended to use is McDougalls Supreme Sponge – Premium self raising flour. They are lovely and i wouldn’t use anything else for this type of cake. Quick question: Can I substitute the cherry preserve to something else? found your site after seeing the amazing ink champagne cake pops on pinterest…I am doing a large candy/dessert buffet for my sister-in-laws baby shower (twin-one boy/one girl) and bought the exact striped baking cups in blue and pink you used for this recipe. I needed a special cake/icing that adults and kids would enjoy-the pink icing is perfect ( and sounds delicious)! thanks! Tried these they were great. Ooh these worked out so well! I always struggle to get a good cupcake recipe that will cook evenly in those baking cups. Thanks! wouldit hurt if i add baking powder? because the usual recipes always include baking powder..
Hi, what does the salt do in the icing? wont it make the icing watery? Hey,in 3 weeks time it is my boyfriend’s biadrthy, will definitely make it.So, I was wondering, since I can’t find shredded sweetened coconut, can I instead use simply shredded dried coconued (that kind of that is on Rafaello)? Hi Rosie, I am a baker all the way from Nigeria and I must admit your recipes are amazing… Instead of using black gel color can I substitute it for purple.. Thank you. Hi Busola! Thank you for the kind words–it means a lot! Yes, you can certainly use purple gel color in place of the black. I hope you enjoy the cupcakes! So I thought you could not use Dutch process with baking soda, or is that just for cookies? Anyway, I would like to make these but would love to fill them with something. What do you suggest? And how do I go about filling cupcakes? Dutch-processed cocoa powder, acids stripped, dark color, reach for the baking powder! Natural cocoa powder, acids present, light in color, grab that baking soda! You can substitute natural cocoa powder if you’re out of Dutch-processed cocoa powder. Although, it’s not a good idea to substitute Dutch-processed cocoa when you’re out of natural cocoa powder. Since I ended up using natural cocoa powder anyway – which you pair with baking soda – they turned out great!